In determining barrier height of a top against free rotation, one requires the direction cosines of the top- axis relative to the principal axes. Determination of direction- cosines for a top-axis in a non-planar molecule is not straight-forward. Therefore, a general formalism to determine direction- cosines of a top -axis has been presented for the first time. 2. Hirschfelder J O. J Chem Phys, 8(1940)431. 3. Colthap N B, Daly L H & Wiberley S E, Introduction to Infrared and Raman Spectroscopy,(Academic Press, N Y and London),1964. 5.Shanker R , Ph D thesis, Banaras Hindu University, India, 1994. Stable complex of Co(II) with 2-thiouracil of the composition [Co(C4H4N2OS)3H2O] has been isolated in the solid state, and characterized on the basis of chemical analysis, magnetic measurement, IR and Raman spectral studies. The spectral studies indicate that the ligand 2-thiouracil acts as monodentate and coordination takes place through sulphur of (C2=S) group. The ligand and its Co-complex were tested for their activity against Dalton’s lymphoma and it was found that they are effective antitumor agents. 3. 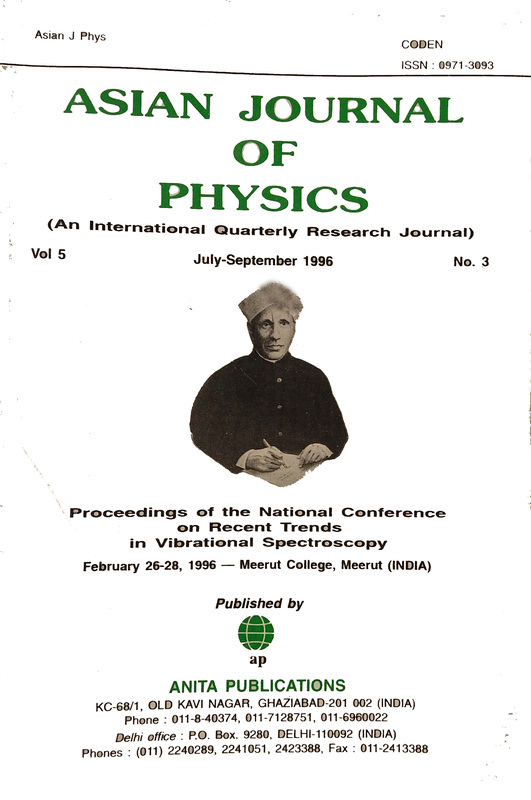 Rastogi V K, Mital H P & Sharma S N, Indian J Phys B, 64 (1990) 312. 4. Rastogi V K, Lal B, Arora C B & Gupta S L, Procd. IXV International Conf on Raman Spectroscopy, (John Wiley & Sons, N Y)), 1994,p 952. 6. Rastogi V K, Singhal S K, Upadhyay M & Dublish A K, Procd.XV International Conf on Raman Spectroscopy, (John Wiley & Sons), 1996. The present note reports the thermodynamical functions viz enthalpy, heat capacity, free energy and entropy of 4-amino-2-chlorobenzonitrile molecule, calculated using vibrational frequencies obtained from IR and Raman spectra of the molecule. 1. Sharma Y C, Yadav B S & Pandey A N, Asian J Phys, 3(1993)175. 3.Hellwege K H & Hellwege A M (Eds), Landolt Barnstein Numerical Data and Fundamental Relationships in Science and Technology New Series: Structural Data for Free Molecules, (Atomic and Molecular Physics), Vol 7, 1976 and Supplement to volume II/7, Vol 15, 1987. Springer Verlag, Berlin, 1976,1987. The optical emission and excitation spectral studies in KBr: Eu2+ and Mn2+ single crystals at, different sample conditions have been analysed to identify the various aggregates and precipitates of both impurities and possible energy transfer from one impurity to another. The emission obtained at 525 nm in the both grown samples at RT and LNT is proposed to be due to radiative energy transfer from Eu2+ to Mn2+ ions, the latter being in Suzuki phase. The RT emission spectra of the samples annealed for long time at 220 °C and LNT emission spectra of as grown samples identify the growth of different aggregates of Eu2+ and Mn2+ ions at the expense of (I-V) dipoles of the two impurities. © Anita Publications. All rights reserved. Many investigations have been devoted to divalent impurity doped alkali halide crystals which exhibt intetresting peculiarities due to the presence of a cation vacancy compensating the electrical extra charge of the divalent ion. The resulting (I-V) pairs have been studied by different techniques as optical [1-5], EPR , ITC and ionic conductivity studies . Particularly, the optical properties of Eu2+ ions in alkali halides are fairly well understood. The Eu2+ -ions doped in KBr host have two absorption bands  in the UV region of the spectrum, with peak positions at 250 nm and 344 nm. These bands are due to dipole allowed transitions from the ground state 8S7/2 of Eu2+ ions to the splitted crystal field 5d orbitals. The high-energy band is due to transitions from the ground statet of the Eg component of the 4 f 6(5d) configuration, while the low energy band is attributed to the T2g component of this configuration. As these transitions are dipole allowed, their oscillator strengths are high making the Eu2+ -doped KBr system an efficient absorber of UV light. The optical properties [9,10] of Mn2+ ions in alkali halides are also fairly well understood. The absorption bands of Mn2+ ions in alkali halides are relatively weak because these arises from spin and parity forbidden transitions. The oscillator strength of these transitions is around 10–7, which makes Mn2+ doped systems weak absorbers of UV light.